Official resolution of support from the city of Sturgis. Official resolution ofsupport from the Sturgis Area Chamber of Commerce. The Meade School District would like to thank the Sturgis Motorcycle Rally inc. for their generous donation of $5000. The money will be used to bring the Delta Dental Mobile Bus to the Meade School District for one week every February and November. The dental bus provides qualifying children dental exams, cleanings, sealants, fluoride treatments, and filling, free of charge. The Sturgis Motorcycle Rally Inc. continues to help bring this program to our schools. The Delta Dental Mobile will be at Piedmont Valley Elementary, February 12-16, 2018. Qualifying children can received free dental services. Call the school nurses office at (605)347-2610 for more information. 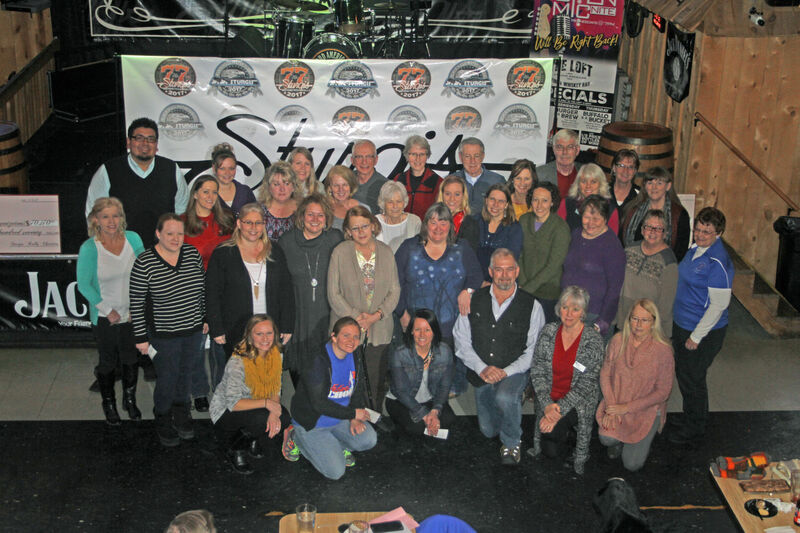 The Sturgis Rally Charities Foundation distributed $70,170 to 32 nonprofit organization in a ceremony at the Load American Road House on Thursday, Jan 5. The funds came from Sturgis Motorcycle Rally Incorporated (SMRI) $50,000, The City of Sturgis Rally Sponsorship program $17,827 and the Sturgis Camaro Rally $600. With requests of more than $106,000 from 47 organizations, the committee had to make some tough decisions. Gordon Kotab, Sturgis Kiwanis Food Pantry said about the donation: "This will put food on the pantry’s shelves and is very much appreciated." Kotab said the food pantry purchased over $42,000 in food last year that assisted 250 individuals and families in Meade County. The Food Pantry award was $7,000. Tammie Brock, CISS Executive Director accepted $10,000 for the center, and said: “it keeps the doors open at the shelter." Northern Hills Alcohol & Drug, $1,500 was accepted by Mary Fossum, of Compass Point said the funds will be used for motivational incentive for people to stay in treatment. The Rally Charities distribution recipients all were extremely grateful and shared what the funds would be used to fill many unmet needs in the community. The Sturgis Rally Charities committee members include: Sandi McNenny, Marcia Johnston, Mary Ann Stroschein, Rhea Crane, Kathy Hersrud, Lon Harder, Denzel Nonhof and Tessa Gunderson. STURGIS, S.D. - After spending the last several weeks in court, Sturgis Motorcycle Rally, Inc. (SMRi), a South Dakota nonprofit corporation and the official stewards of the STURGIS brand, today heard a unanimous and overwhelmingly positive verdict in a lawsuit filed by SMRi several years ago. Wal-Mart, Rushmore Photo and Gifts and its officers, were found liable for infringement of SMRI’s trademarks STURGIS, STURGIS BIKE WEEK, STURGIS Composite Design Mark, STURGIS MOTORCYCLE RALLY, and STURGIS RALLY AND RACES™, dilution of SMRi’s STURGIS mark, violations of the Anti-Cybersquatting Consumer Protection Act on seven different internet domains, false advertising, and unfair competition. The jury unanimously found against Rushmore on its claims of fraudulent registration and interference with business relations. Thousands of retailers around the world carry licensed STURGIS-brand products every year, and, through royalties generated from those sales, SMRi is able to donate funds to benefit the local Sturgis community. 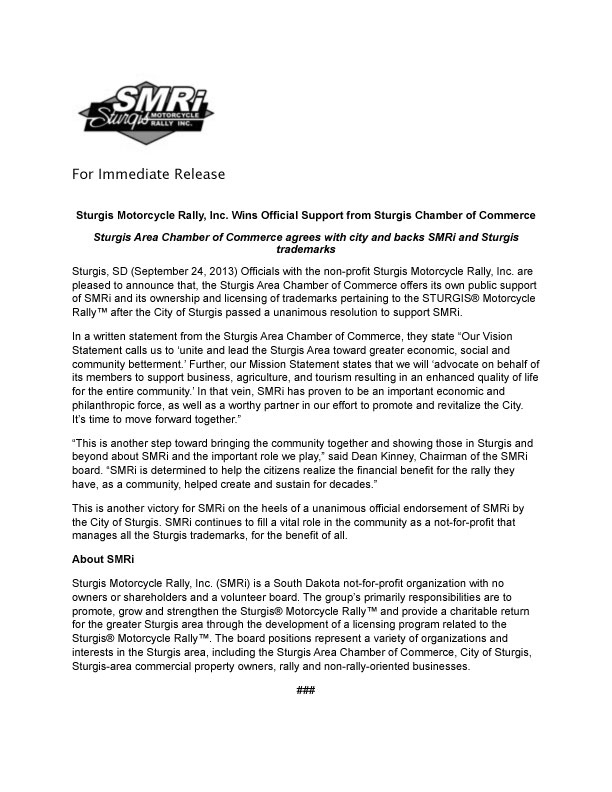 In keeping with its stated mission to “maximize the value of the intellectual property of the Sturgis Motorcycle Rally on behalf of the greater Sturgis area,” SMRi donates each year to Sturgis Rally Charities Foundation, who then disperse funds to literally dozens of local charities that have come to depend on revenues generated by SMRi licensing. Causes helped include Sturgis elementary school after-school programs and PTA, the Sturgis volunteer fire department, Sturgis Public Library, Sturgis Area Arts Council, Sturgis Alliance of Churches, and many many more. Sturgis Motorcycle Rally, Inc., enjoys widespread community support, as well as official endorsements from The City of Sturgis City Council and the Sturgis Area Chamber of Commerce. STURGIS, S.D. 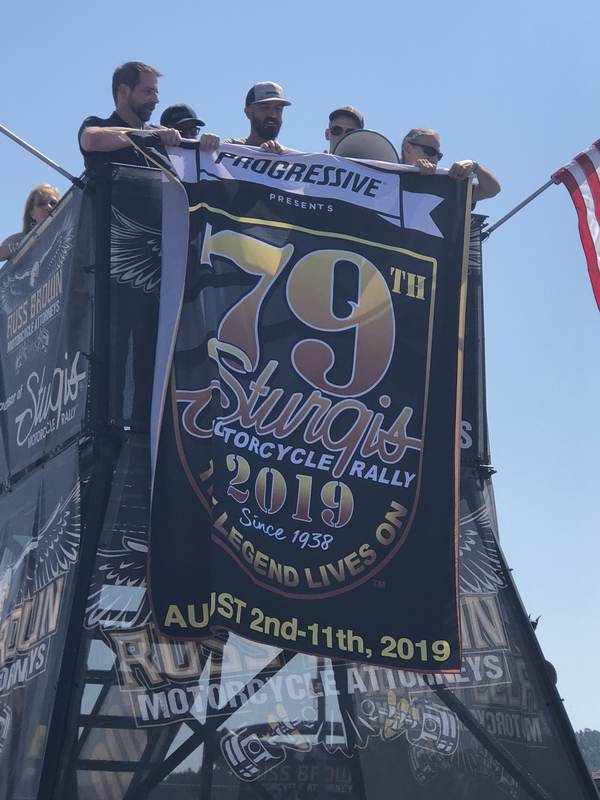 - Right smack dab in the middle of the giant 75th Sturgis Motorcycle Rally, the rally organization and Sturgis City Council, continued what they feel is the start of a new tradition … unveiling next year’s logo on Main Street in front of thousands of bikers. "In planning the 76th logo, we really wanted to celebrate the men and women who fought and really died for our country and make sure that we had a symbol that really embraced all the freedom and liberty that we have here in this country," Daniel Ainslie, Sturgis city manager, said. The Sturgis script is still embedded on it as it will every single year. Anyone pondering the idea of attending next year’s rally should probably make hotel and camping reservations right now. Next year’s rally is Aug. 8-14. Copyright 2015 by KOTATV.com. All rights reserved. This material may not be published, broadcast, rewritten or redistributed. 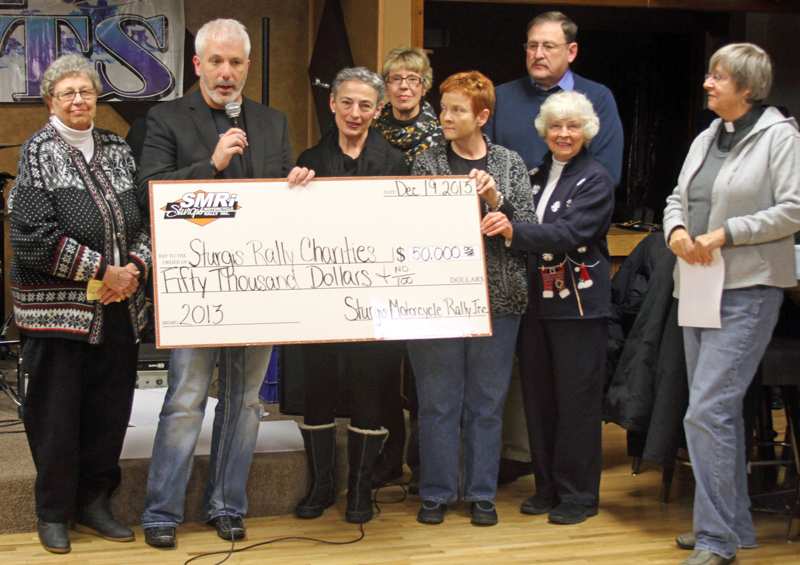 Sturgis Motorcycle Rally Inc. (SMRi), official stewards of the Sturgis brand, have announced that they will once again donate $50,000 to Sturgis Rally Charities Foundation who will in turn distribute that to local charities in and around the Sturgis community. This is the third year in a row that SMRi has made a contribution, all of which have been made possible by community supported licensing agreements that SMRi manages for the Sturgis brand. In addition SMRi has the pleasure of welcoming two new volunteer board members, Scott Reiman and the Mayor of Sturgis Mark Carstensen "We are really excited to have Scott Reiman, Vice President at First Interstate Bank in Sturgis and Sturgis Mayor Carstensen as our newest members of the SMRi all volunteer board. We know they will make valuable members to our team and are looking forward to a great 2014." Said Dean Kinney Chairman of the board for SMRi. 2013 was a very encouraging year for Sturgis Motorcycle Rally Inc. They gained additional community support as well as official endorsements from The City of Sturgis City Council and the Sturgis Area Chamber of Commerce. SMRi have continued to be the official stewards of the Sturgis brands and to show their support they once again are supporting the community by giving back to Sturgis Rally Charities. Hundreds of retailers around the world carry Officially Licensed Sturgis Products every year, through those sales, SMRi is able to donate funds to benefit the local Sturgis community. SMRi's volunteer board is pleased to support Sturgis Rally Charities and in turn the organizations that serve and support a variety of causes in the area. SMRi values the time and hard work that these groups put into educating and protecting local children, supporting and rebuilding the community, and assisting community members in need. SMRi appreciates the strong participation of retailers throughout the world that support the licensing program and would like to personally thank them, and all the wonderful organizations that have labored to make the Black Hills and the Sturgis community a better place for all. Sturgis Motorcycle Rally, inc. (SMRi) is a South Dakota not-for-profit organization with no owners or shareholders and a volunteer board. The group's primarily responsibilities are to promote, grow and strengthen the Sturgis Motorcycle Rally and provide a charitable return for the greater Sturgis area through the development of a licensing program related to the Sturgis Motorcycle Rally(TM). The board positions represent a variety of organizations and interests in the Sturgis area, including the Sturgis Area Chamber of Commerce, City of Sturgis, Sturgis-area commercial property owners, rally and non-rally-oriented businesses. Subscribe to our newsletter to be sent updates on the Sturgis® Motorcycle Rally and related events.